The North Beach Business Association, in partnership with SRES Productions, is proud to present the 65th Annual North Beach Festival. The North Beach Festival is first outdoor street festival in the country! The North Beach Festival is held in historic North Beach District, known to locals and visitors alike as San Francisco’s Little Italy and the home of the famed beat generation, including notable figures like Jack Kerouac and Allen Ginsberg, and the poet and publisher behind City Lights Bookstore, Lawrence Ferlinghetti. The North Beach Festival spans numerous quaint streets in the heart of the district including Grant Avenue, Green Street, Vallejo Street and Columbus Avenue. The North Beach Festival features over 125 fine arts and craft booths, a Children’s Chalk Art Area, gourmet food booths and trucks, the Blessing of the Animals, poetry readings, performances by Circus Bella, two stages with live entertainment, a beverage garden, and much, much more. Let their creativity shine in North Beach and buy a square and street chalk at our Children’s Chalk Art Area on Vallejo Street between Grant Avenue and Columbus Avenue. The Blessing of the Animals takes place at The National Shrine of Saint Francis of Assisi, 610 Vallejo Street. Circus Bella is a full-force, non-stop kaleidoscope of thrilling feats of balance and strength, elegance demonstrations of grace and poise, and outrageous humor of slapstick antics. The circus showcases static trapeze, family foot juggling, a 9-person club passing act, contortion, hula hoop, original clowning, and more. The music is originally composed and directed by the highly acclaimed Rob Reich and draws from French Waltz, New Orleans Jazz, Klezmer, and American Circus March. Audiences are bedazzled, lifted up, and join in the celebration of the heart of circus: community, joy, and achieving the impossible. 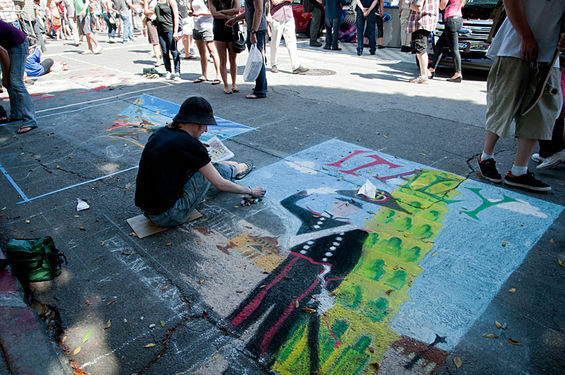 Visitors to the North Beach Festival explore vibrant Grant Street.